Michigan auto plants could be some of the biggest casualties if the President’s threat to shutdown the US-Mexican border comes to fruition. (WXYZ) — Michigan auto plants could be some of the biggest casualties if the President’s threat to shutdown the US-Mexican border comes to fruition. 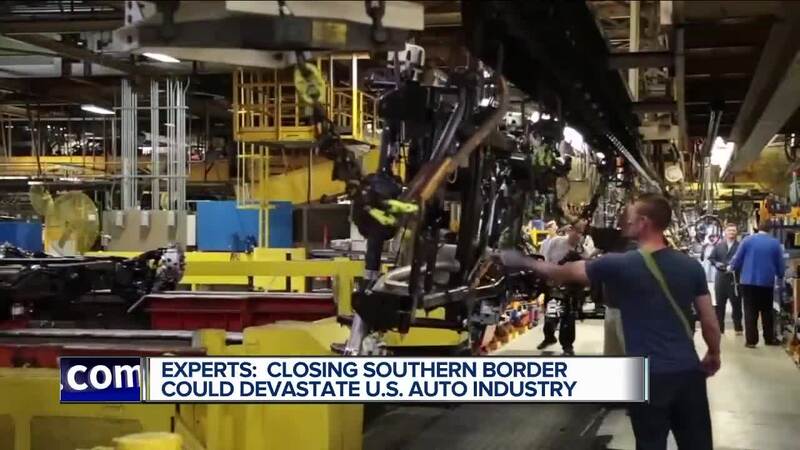 Leading experts in the auto industry theorize that the entire U.S. auto industry would shutdown within a week if President Donald Trump follows through with a pledge to shutdown the border — the real threat, according to Kristin Dziczek, the vice president of the Center for Automotive Research, is that 37-percent of auto parts used in US-built vehicles come from South of the border. “I don’t know how you ‘war room’ around 37-percent of parts coming in from Mexico,” said Dziczek, referring to how auto companies have entire war rooms where they discuss contingencies if a part supplier goes down. The Trump administration is looking at closing the border to stop illegal immigration. According to Dziczek, the threats to shutdown the border didn’t seem real a week ago. This week she’s been getting phone calls and urgent questions from industry insiders trying to wrangle details about what a shutdown would mean for the industry. She pointed to wiring harnesses as one example. Roughly 70-percent of the integral part are manufactured in Mexico, another 10-percent are manufactured further South and pass through the US-Mexico port of entrees. “We don’t make very many of them, almost the entire industry is supplied by Mexico and places South,” she said. Some parts, as Dziczek explained, are sourced out of the country to be competitive with cost on a global scale. The wiring harness example is interesting because she notes that eventually the part would be irrelevant, so there’s no push to source the part in the U.S. Other parts involved ranging from engine components to anchors for seatbelt are built outside of the U.S. and plants have neither the space or the ability to stockpile those goods. Matt Blunt, the president of the American Automotive Policy Council, told CNN that the impact on companies like Ford, GM and Chrysler would be noticeable. "Any action that stops commerce at the border would be harmful to the US economy, and in particular, the auto industry," Blunt said. "Access to Mexico's marketplace and North American integration are critical to operations in the US."